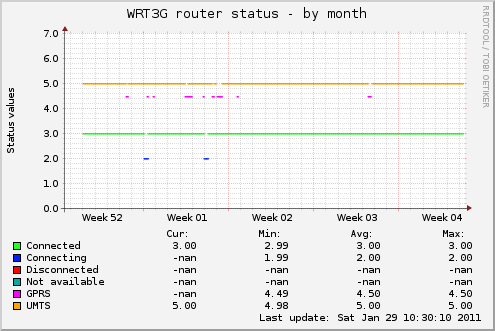 A command line tool to get status information from a Linksys WRT3G router, reboot it and a munin plugin to track the connection state. This should automatically download all dependencies. The main script has been installed into your $PATH, so running linksys-wrt3g --help should give some output. The tool itself needs to run (must be configured). Make sure it works. The source code can be found in the git repository.